The option SCALE=NONE is specified to produce the deviance and Pearson goodness-of-fit analysis without adjusting for overdispersion. The RSQUARE option is specified to produce generalized measures of the fitted model. The CLPARM=WALD option is specified to produce the Wald confidence intervals for the regression parameters. 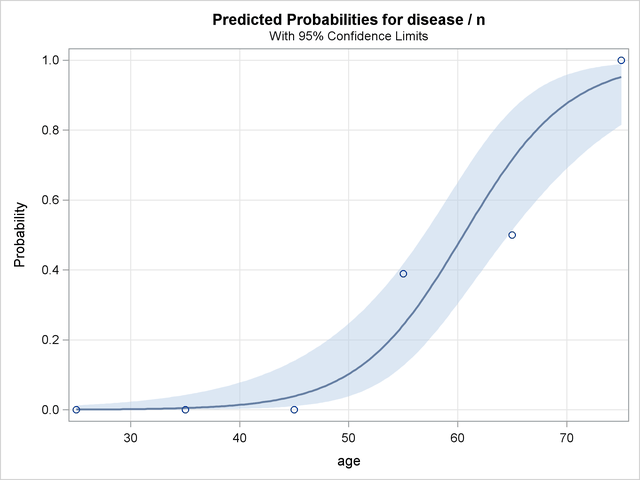 The UNITS statement is specified to produce customized odds ratio estimates for a change of 10 years in the age variable, and the CLODDS=PL option is specified to produce profile-likelihood confidence limits for the odds ratio. 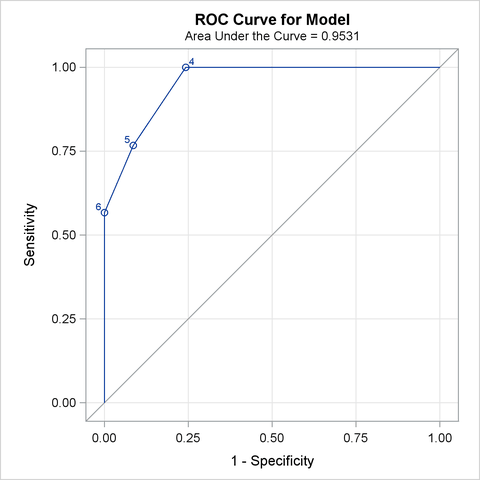 The PLOTS= option with ODS Graphics enabled produces a graphical display of the ROC curve, and the EFFECTPLOT statement displays the model fit. The results in Output 53.7.1 show that the deviance and Pearson statistics indicate no lack of fit in the model. Output 53.7.2 shows that the R-square for the model is 0.74. The odds of an event increases by a factor of 7.9 for each 10-year increase in age. Since ODS Graphics is enabled, a graphical display of the ROC curve is produced as shown in Output 53.7.3. Note that the area under the ROC curve is estimated by the statistic c in the "Association of Predicted Probabilities and Observed Responses" table. In this example, the area under the ROC curve is 0.953. Since there is only one continuous covariate and since ODS Graphics is enabled, the EFFECTPLOT statement produces a graphical display of the predicted probability curve with bounding 95% confidence limits as shown in Output 53.7.4.